When only the maximum in performance and control is required. The Electric Hydraulic Fork Mounted Drum Grippers accommodate 30 and 55 gallon steel, plastic and fiber drums. Available in single or double drum designs. 12V DC power standard. Battery included. 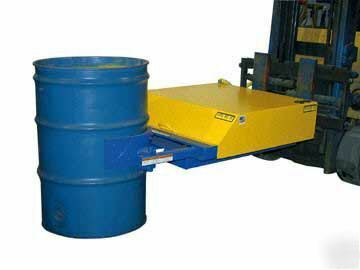 Allows for lifting and moving of drums in the vertical position only. Includes hand control on coil cord for controlling the gripping arms from the seat of the fork truck. Safety chain is included to secure the gripper to the fork truck. Welded steel construction. Painted finish.